Options: Funstuff® 12 Regular stick asst. set. Options: Funstuff® 12 Jumbo stick asst. set. 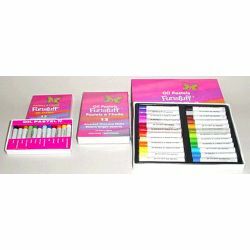 Smooth, paper wrapped oil pastels available in regular and jumbo assortments. Sets of 12 regular and 12 and 24 Jumbo in brilliant arrays of colours.